The firm is expected to make an announcement on Tuesday regarding the cuts, which are thought to mainly affect its two plants in Lancashire. Union Unite warned the cuts would undermine the nation's defence and said it was demanding urgent talks with BAE. Up to 10,000 people work at the Warton and Samlesbury plants, where aircraft assembly takes place. 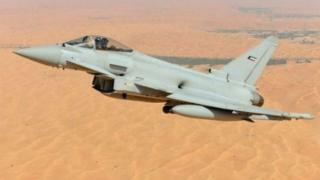 The cuts are believed to centre on the lack of orders for the Eurofighter Typhoon on which 5,000 staff work. The Warton and Samlesbury sites are involved in making parts and the final assembly of the Typhoon fighter. BAE is yet to make a specific announcement, but a spokesman said the business "continually reviews its operations to make sure we are performing as effectively and efficiently as possible". "If and when there are any changes proposed we are committed to communicating with our employees and their representatives first," he said. Asked about the reports, Prime Minister Theresa May's official spokesman said it would be wrong to pre-empt any announcement by the firm. However, he said: "We do have a long track record of working with BAE Systems and with its works and we'll continue to do so." Unite assistant general secretary Steve Turner said the government could end the uncertainty for thousands of British BAE defence jobs "at a stroke by committing to building the next generation fighter jets here in the UK". He said BAE must also come clean on its plans, too. "If these job cuts materialise it will significantly undermine our nation's sovereign defence capability and leave us reliant on foreign powers and foreign companies for the successor to the Typhoon and the defence of the nation. "Once these jobs are gone, they are gone for a generation and with them the skills and ability to control our own defence and manufacture the next generation of fighter jets and other defence equipment in the UK." He added: "At a time of Brexit, these are precisely the kind of jobs the UK government should be protecting. "Rather than shipping our defence spend overseas to factories in America and cutting defence, ministers should be investing in jobs, skills and communities by buying British." Fylde Conservative MP Mark Menzies said it was a "deeply unsettling time" for BAE workers. But he hoped it would end up the same as in November 2015 when hundreds of redundancies were announced but "in reality, very few people left the business as they were deployed on other projects". He said the firm would look at other opportunities for the workers, such as on BAE's nuclear submarine and shipbuilding programmes. Mr Menzies said: "Potentially lucrative contracts on the way from Saudi Arabia, Qatar and others could help sustain these jobs." Ribble Valley MP Nigel Evans said the job losses would be a "massive detriment not only to my own constituency but to Lancashire as a whole". In a statement he urged BAE systems to put emphasis on voluntary redundancy and offer "transitional assistance" for redundant staff to find new employment. He said he was working with Chorley MP Lindsay Hoyle on the issue and they were contacting all the affected North West MPs "to get them on board when representations are made to the Secretary of State for Defence". Nia Griffith MP - shadow secretary of state for defence - said it was "devastating news" for workers and their families. "The men and women who work on the Eurofighter are highly skilled and the potential loss of these jobs would have an appalling impact on them, the local economy and wider supply chains," she said. The Labour MP for Llanelli also called on the government to urgently come up with a "clear plan to secure these jobs" and said it "must give long-term certainty to the industry". What's it like to fly a Typhoon jet?